The Toledo Zoo has been a recurring customer of GPRS the past few years. Recently, their 70-year old museum was experiencing water damage to its northwest foundation wall and was flooding the basement on a frequent basis. The zoo decided that repairs were necessary and the foundation needed to be exposed and repaired. The zoo decided to contract GPRS to perform a ground penetrating radar survey to locate underground utilities near the foundation wall so that no interruption or damage to existing utilities would be experienced during the excavation. Project leader Gary Balsom was concerned that the area had gas, electric, fiber optic, and other utilities that would be in the vicinity to the area. Toledo technician John Kessinger mobilized to the zoo on short notice and was able to identify and locate the underground pipes with the ground penetrating radar. 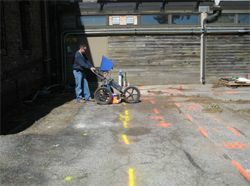 Within just a few short hours, the entire area was surveyed and all the underground utilities were marked out onto the surface. You can contact John Kessinger for Northwest Ohio at (419) 467-1444 or by email at john.kessinger@gprsinc.com.